I understand by IP business value the benefits that intellectual property can bring in supporting the growth of a business (whether though revenue generation, facilitating alliances or other strategic uses). Obviously the business value of any IP is highly dependent on its appropriate use – therefore dependent on the skill of the user to apply strategies and communicate to different actors within his environment. I understand by market value the monetary amount that someone is willing to pay for purchasing a patent or licensing the rights provided by the intellectual property. 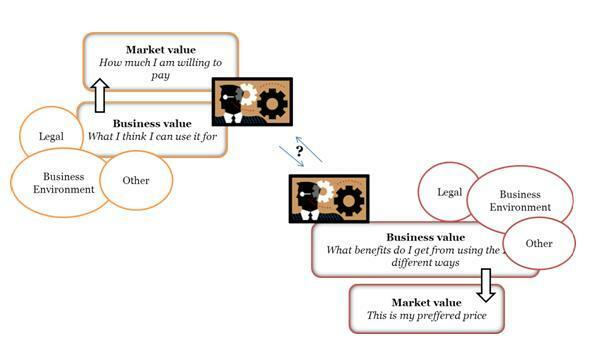 Market value is dependent on the ability of one party to communicate the value proposition intrinsic to a specific piece of IP (not only as he/she perceives them but as the potential buyer/licensee would). This subjective and contextual nature of IP together with factors such as time, industry dynamics and technology trends into the equation makes determining IP market value a difficult exercise (to say the least). Now take a step back and think about the root of things. An IP deal can be completed successfully if: on one hand the seller has the ability to communicate the IP’s value through the benefits resulting from its use. On the other hand the value proposition is interpreted successfully by the auditor which is not only aware of the possible usage benefits but also knowledgeable regarding how to best take advantage of the benefits in its specific market context. The market value of IP is therefore dependent not only on the usage context but also on human capital involved in the transaction and its education regarding the utility of IP in reaching business goals. This underlines, again, the need for Strategic IP advisors to not only set in place policies that will help the client for a limited time but also to engage in continuing support and educate their clients about how to independently interpret the many variables IP influencing their business activities.